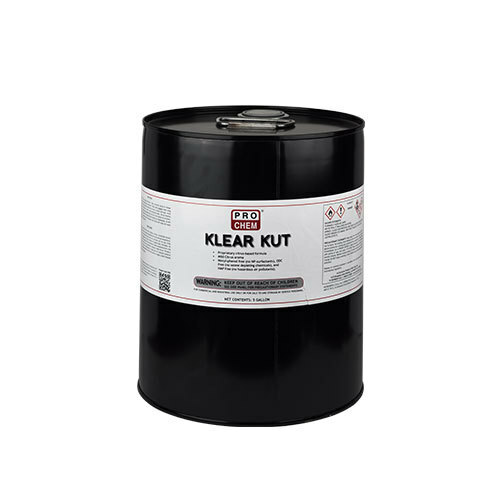 KLEAR KUT | Pro Chem, Inc.
KLEAR KUT is a concentrated blend of d-limonene, citrus components and surfactant. It has a high concentration of d-limonene, making it better for applications requiring more solvent cleaning power. It is best for cleaning applications where a water rinse is used for. KLEAR KUT can either be diluted with water either at the time of use or blended with other solvents to fine tune its formulation. This product is formulated with the environment in mind. It is nonyl-phenol free (no NP-surfactants), OCD free (no ozone depleting chemicals), and HAP free (no hazardous air pollutants). Open container slowly to release pressure that may be caused from temperature changes. Wear safety goggles when using this product and do not allow this material to come into contact with eyes. Use in well-ventilated areas. Do not breathe vapor. Drum lining may occasionally chip and fall into the bottom of container; product should be filtered or strained before blending or repackaging. Wash hands thoroughly with soap and water after handling this product.